French Bulldog News Forums - Learn CPR: It Could Save Your Dog's Life! You MUST have belief and confidence. The ABC’s should always be followed 1, 2, 3's. The first step in animal CPR (like human CPR) after determining that the animal is non-responsive, is to obtain an open airway. You should not continue past the airway, until this step has been achieved! Is the air passageway though the mouth open? You should be able to open the mouth and look inside easily. If you can’t, stop now! Your dog does not need CPR! Extend the neck and pull the tongue forward. If there is anything in the mouth, clean it out with your fingers. 1. Carefully pull the tongue straight out of the animal’s mouth to open the airway. WARNING: even an unresponsive dog may bite by instinct!! 2. Make sure that the neck is reasonably straight; try to bring the head in-line with the neck. WARNING: Do not over-straighten the neck in cases where neck/head trauma exists. 3. Attempt 2 rescue breaths, by closing the mouth, and performing mouth-to-nose ventilation. If they go in with no problems continue to B-Breathing. 4. If not, reposition the neck and try step 3 again. 5. Visibly inspect the airway by looking into the mouth, and down the throat for foreign objects blocking the airway. Unlike human-CPR, rescuers may reach into the airway and remove foreign objects that are visible. 6. If you still can’t breathe into the animal, proceed to the Heimlich maneuver (More on "How to Perform the Heimlich Maneuver if Your Dog is Choking" below). Only perform the Heimlich Maneuver if you could not remove the object from your dog's airway. 1. Turn her upside down, with her back against your chest. If she's large and/or heavy, you may need someone to help you hold her. 2. Wrap your arms around her, just below the rib cage (since you're holding her upside down, it's above the rib cage, in the abdomen). Grasp your fist with your other hand. 3. Using both arms, give five (5) sharp thrusts to the abdomen. The thrusts should feel like quick bear hugs. Perform all five as if each one is the one that will force the object from her airway. 4. After the five thrusts, check her mouth and airway for the object. If you see it, remove it and give two more mouth-to-nose ventilation. If the breaths still do not go in, or feel restricted, repeat from Step 1, above. After achieving a patent airway, one must determine whether the animal is breathing. Watch the chest and if, within 5 seconds at the most, you do not see the ribs move up and down, you need to blow air forcefully twice, 2 seconds each, into the dog’s nose . 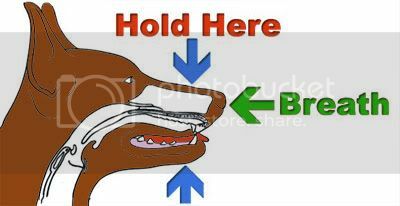 With large dogs you should simultaneously hold the lips closed if you can’t cover the mouth. 1. Carefully pull the tongue straight out of the animal’s mouth to open the airway WARNING: even an unresponsive dog may bite by instinct!! 2. Make sure that the neck is reasonably straight; try to bring the head in-line with the neck. 3. WARNING: Do not over-straighten the neck in cases where neck/head trauma exists. 4. Breathe at 12 breaths per minute (1 every 5 seconds). With each breath just make the chest rise (do not over-inflate, especially on a small animal). IMPORTANT: If the breaths do not go in, stop and return to A-Airway! 5. Proceed to C-Circulation, while continuing breathing support as necessary. This is the final step of CPR and should ONLY be started after the A-airway and B-breathing steps have been completed. 1. Does the animal have a pulse and are the pupils dilated? If there is no pulse and the pupils are fully dilated, you know that you also need to start chest compressions and assisted ventilation. The pupils are fully dilated if you look into the eyes and don’t see the iris ( that part within the eye that gives it the normal color; blue, green, etc. ) The center of the eye will look like a large round dark spot. 2. Make sure that there are no major (pooling/spurting blood) points of bleeding. Control as necessary by applying pressure with your hand. 3. Check for a pulse in the groin (check carefully on a conscious dog or cat!). The best place to feel the pulse in inside the back leg up near the body. You should practice feeling your dog’s pulse if you have not done this. 4. Lay the animal on its right side. 5. Locate your hands where its left elbow touches the chest, approximately the middle of the rib-cage (for cats use 1 hand in a squeezing motion). 6. Compress the chest 15 times followed by 2 rescue breaths (3 compressions every 2 seconds). 1/2” - small dogs & cats. Even the worst CPR is better than none. Your mission is to keep the brain alive and without oxygen it will die. You are the ventilator and pump to keep this dead dog going. If the life spirit is present you can bring the dog back. Talk to the dog, with a living brain it will hear you, and be reassuring. 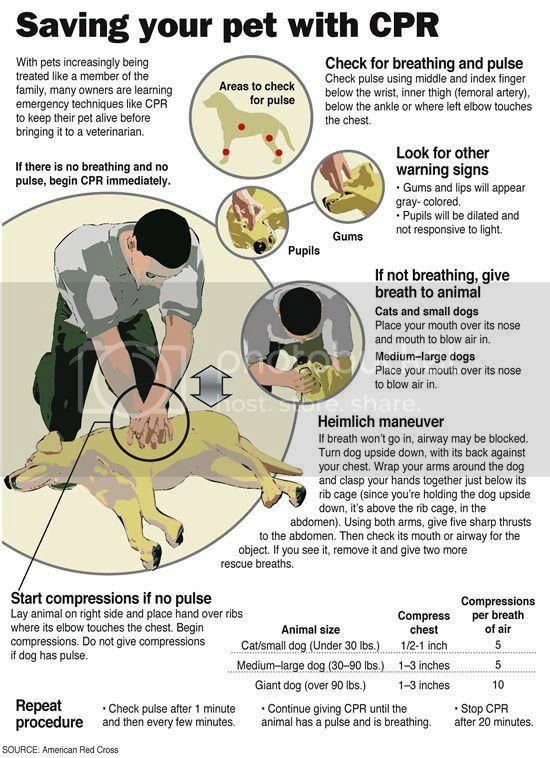 Step 1 - First, determine if the dog is breathing. To find out if a dog is breathing, watch the rib cage and see if it goes up and down. Also find the pulse on your dog, which you can find behind the pad on their feet on the front foot or back foot. And feel the rib cage just behind the left elbow. If the heart is beating, you should be able to feel it there. If breath or respiration can be detected, then you can assume the that heart is functioning and chest compressions will not be necessary. 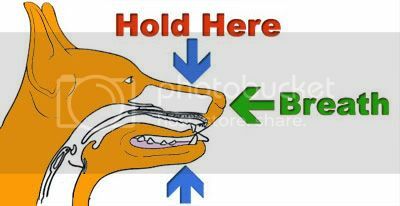 If the dog is not breathing, you should clear the airway and give 2 good breaths through the dog’s nostrils with the dog’s mouth held closed. Step 2 - Check for a pulse. 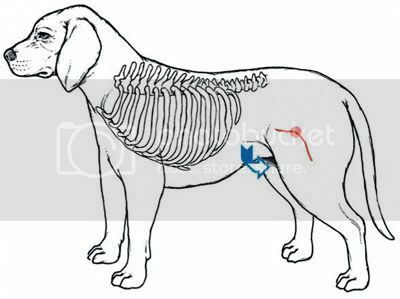 Another place to check for a pulse on a dog is in the groin area (the crease between the thigh and abdomen). If the dog has a pulse but is still not able to breathe on its own, continue to breathe for the dog, as described in the previous step — at a rate of 1 breath every 5 seconds. If no pulse is found, it’s time to start chest compressions. Lay the dog on its right side. The heart is located at about the front of the elbow in the chest. Place one hand under that part of the dog’s body, and your other hand on top. Compress 1 to 1-1/2 inches for a medium-sized dog, or as much as 2 to 3 inches for a large dog. Do this at a rate of 100 compressions per minute. Step 3 - If you’re alone in your CPR attempt to revive the dog, give one breath every 5 compressions until help arrives or the dog regains consciousness. Continue with dog CPR until you can no longer do it, or help has arrived. 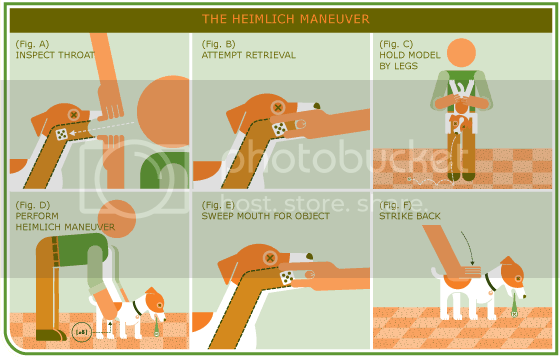 This is my personal story and why knowing the Heimlich Maneuver can save your dog's life: It was Christmas Eve 2010 when our old dog, Ace, keeled over in the kitchen. At first we thought he slipped and then realized he was choking to death. Immediately my hubby got behind Ace, lifted him up a bit and used his fist to push firmly behind the rib cage. A piece of dog kibble popped out and Ace came too instantly. Ace went about his business being a dog that Christmas Eve because we knew the signs to look for, we knew what to do, and we acted fast! Most dogs will chew nearly anything: bones, toys, shoes, socks, and YES, their own kibble. But would you know what to do if something became lodged in the windpipe or stuck on the palate and your dog began to choke? It's important to act fast, as your dog may suffocate if you don't. Sadly, it is not uncommon for a dog to choke because they swallowed things they shouldn't have. If your dog is choking, he will start coughing forcefully, bulge his eyes and paw at his mouth. In order to save your dog's life, you first need to know the signs. 10 Signs your dog is choking! Is your dog pawing at his mouth as if something is lodged? Is your dog coughing forcefully, constantly? Is your dog drooling or gagging? Is your dog wheezing, gasping for a breath? Are your dog’s gums or lips turning blue or white? Another sign of choking is an unresponsive or unconscious dog; in these cases, check the throat and mouth for foreign objects. Is your dog whimpering as if in pain? Is your dog in obvious discomfort? Be very careful when dealing with a choking dog, as even calm animals will panic when they cannot breathe. Protect yourself by restraining the dog, but do not muzzle it. If the dog is standing, put your arms around her belly, joining your hands. Make a fist and push firmly up and forward, just behind the rib cage. Place the dog on his side afterward. If the dog is lying down, place one hand on the back for support and use the other hand to squeeze the abdomen upwards and forwards. 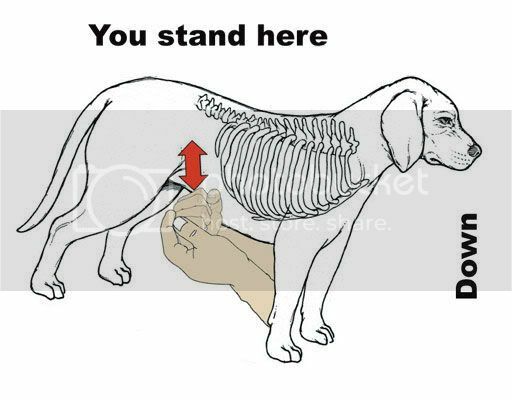 If you don't have time to place your dog on his side, you can stand or kneel behind your dog. Grasp his body at the bottom of his rib cage. Grasp his body at the bottom of his rib cage. Apply firm, quick pressure. Repeat two to five times. Remember that once your dog stops choking, he may try and bite you. Check the dog's mouth and remove any object that may have been dislodges with your fingers. NOTE: The object might be quite a way back towards the throat, so you might have to hunt around and hook it out with your index finger. If the dog required artificial respiration or CPR, seek immediate veterinary attention. It is likely objects stuck in the throat have caused damage. Depending on the length of time the dog was without oxygen and the damage to the throat, the dog may require hospitalization for a few days. In some cases, bronchoscopy (whereby a small camera is inserted into the windpipe to visualize and remove the foreign body) may be recommended. Although this may just be minor scratching, it is still important that a veterinarian examine the dog for potential problems. Sometimes foreign bodies stuck in the esophagus such as bones can cause respiratory distress and mimic choking. The best way to prevent choking is to treat your dog as you would a small child. Although it’s almost impossible to stop them putting things in their mouth, you should always be present and keep an eye on what they’re chewing. Avoid moisture-swollen chew toys, sticks or rawhides, and cut up large chunks of food, especially gristle. T-bones are also known to cause choking when given to dogs.